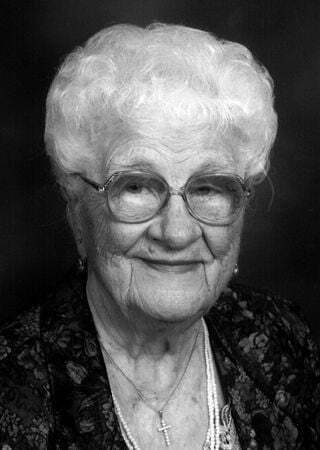 WESTVILLE, IN - Emma A. Truhn (nee Koartge), age 100, of Westville and formerly of Hammond, passed away peacefully on Sunday, April 14, 2019. Loving mother of Allen H. (Mary L.) Truhn of Westville, IN. Proud grandmother of Jeffrey (Charity) Truhn and step-grandmother of Vanessa Schwegman and Michael (Brenda) Schwegman. Devoted great-grandmother of Hunter and Tanner Truhn and step-great-grandmother of Adrin, Dylan, and Ian Schwegman. Fond aunt of numerous nieces and nephews. Cherished Godmother of Marie Sanchez. She was preceded in death by her husband Jessie H. Truhn; her son Bradford "Brad" A. Truhn; her granddaughter Lisa M. Truhn; 1 brother and five sisters. Emma was born in Oak Glen section which is now Lansing, IL and spent most of her life in the Hammond area. She was a long-time member of Saint Paul Lutheran Church in Munster where she was active in the Ladies Aid Group, a Greeter, and a former member of the Alter Guild. Upon moving to Westville, she became active in the Immanuel Lutheran Church in Valparaiso. Friends are invited to meet with the Family on Wednesday, April 17, 2019 from 4:00 PM until 8:00 PM at LaHAYNE FUNERAL HOME, 6955 Southeastern Ave., Hammond, IN Funeral Service will be held on Thursday, April 18, 2019 at 11 AM with Pastor Don Stock officiating at LaHAYNE FUNERAL HOME. Interment Concordia Cemetery, Hammond, IN. In lieu of flowers, memorials may be made to St. Paul Lutheran Church, Immanuel Lutheran Church, or Dunes Hospice. For information regarding services, please contact LaHAYNE FUNERAL HOME at 219/ 845-3600 or visit our web site at www.lahaynefuneralhome.com.